T-Mobile, America's sole purveyor of the Sidekick, begins taking pre-orders today for the new LX version of the well-liked, swivel-screen handset. Customers reserving a unit by the end of the month including through this T-Mobile address will receive theirs May 12 -- one day before the device goes on sale to the general public. 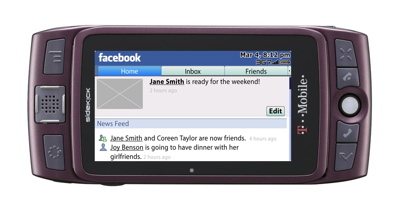 Service-provider improvements to the latest version of the Sidekick include 3G support on T-Mobile's HSDPA network and better data-migration options for those switching from another T-Mobile handset. Inside, there's new GPS functionality; integrated Facebook, MySpace, and Twitter support via Skick-customized applications, including the ability to directly upload photos from the camera (now shooting at 3.2 megapixels) to MySpace and video to other social-networking sites; ShoutCast streaming-radio and YouTube video support; upcoming support for Microsot Exchange; and a 3.2" F-WVGA screen with 854x480 resolution. And friends, they fixed that annoying on-off switch positioning problem. I know. I made a point of checking while I watched a Warren Zevon video on YouTube, flipped the screen up and down, and chattered about the unmistakable hand position of the devoted Sidekick user. Sometimes these companies get more nerd than they bargained for at these demonstrations, you know? Your reporter is, like many Sidekick owners, a loud longtime fan. I still have a working Sidekick 2 in my gadget stash, and the current LX is literally the first gadget I interact with in the morning, since it also serves as my alarm clock (and first eye on Google News). I also share the Sidekick fan's tendency toward detailed, very precise ideas about how the device ought to change and what will cause me consternation, frustration, and hotly worded comments to the editor at hiptop3.com. - The screen is beautiful. At 3.2", the viewing area's a bit larger than that of the current Sidekick LX; at 854x480, it's also brighter, sharper and clearer than many larger and more expensive devices (can you guess which netbooks I'm think of?). Sharp's the hardware provider as usual, and Grandy suggests that that firm views the Sidekick as a nice showcase for what they can accomplish with high-definition LCD tech. - The keyboard is unharmed. Old-timers will remember the unfortunate decision with the Sidekick 3 to make the keys hard and slippery. 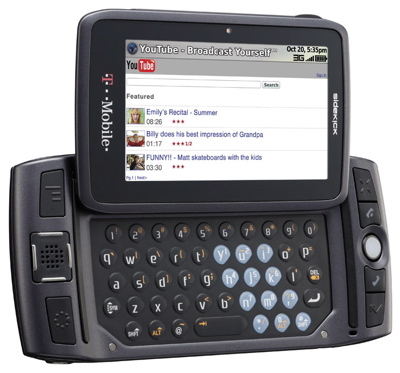 The company edged back to the slightly soft, slightly textured model with the Sidekick ID, and returned to more-or-less orthodoxy with the LX, but some of us get very nervous with T-Mobile messes with a keyboard widely considered to be the best ever shipped on a handset. On the other hand, a slimmer device requires adjustments, and T-Mobile's been wrestling with that design imperative for years. I'm pleased to report that the keyboard I used was much like that of the current LX; there's been a slight change in key shape, but otherwise I found thumb-typing to be much the same. - Social networking is go. The company regularly evaluates what sorts of sites users visit through the browser, and found that two-thirds of all traffic is currently going to social networking sites, generating 15 million requests each day. (Grandy told me that Sidekick traffic on AIM is so heavy that that service can detect a network outage almost before T-Mobile does.) In addition to the usual IM triumvirate of AIM, Yahoo Messenger and Microsoft Live (sorry, kids, no Gtalk), the handset now integrates Facebook, MySpace, and Twitter support. Integrating that support means good things for both performance and presentation -- most obviously in my brief time with the gadget, update notifications right on the status bar, as happens now with mail and IM and such. - Let there be light. There's a slender notification light along the edge of the screen now, a bright blue bar that signals when you've got a message or your browser page has loaded. I noticed that it gives the keypad an subtle, appealing glow as well. The trackball, meanwhile, continues to double as a multicolor signal. - Seriously, YouTube right there in the conference room. Grandy tells me that battery life is up considerably, to two days' standby. I'll know more about that when I have sustained testing time; when I get that, I suspect I'll be using YouTube to drain that sucker. Repeatedly. Strictly for professional testing purposes, you understand. New personalization options -- sideload a new ringtone or record your own -- are also on my must-see list, and I hope to see some of the fancy case-customization options T-Mobile first explored with last year's Sidekick 2008. And down the road, I look forward to looking at upcoming support for Microsoft Exchange, an addition that should help attract more users to the funky, capable device. For now, the pre-order period runs until April 30. For pre-ordering customers, the cost of the new Sidekick LX is $199 with a two-year service agreement.